Trey Canard won!.....A moto. He didn’t the overall thanks for a fourth in moto one, but his win in the second one was inspiring. Trey hasn’t finished first in a race since his massive series of injuries began back in 2011. More on him in a bit, but let’s focus on the overall winner. Ryan Dungey continues to step up under pressure as the series’ winds down. He was darned solid going 1-2 for the overall, handling serious heat from his championship rival Ken Roczen in moto one, and then tearing through the pack in the opening laps of moto two to get to the front. Wait, wait, did we just say Dungey tore through the pack in the opening laps? Does he ever do that? Well, he was on the gas this time. The super-starter Yamaha riders Justin Brayton and Phil Nicoletti were in front, Roczen passed Dungey, Roczen got held up by Brayton and Nicoletti, and Dungey rolled past all three quickly to get into third place. Later in the moto he’d catch Eli Tomac and get to second when Tomac bobbled, and that was enough to get the overall. On a rough track, Dungey was fast, precise and aggressive—and now with two overall wins in a row, he’s sliced Ken Roczen’s points lead in half, down from 14 to seven with two races remaining. 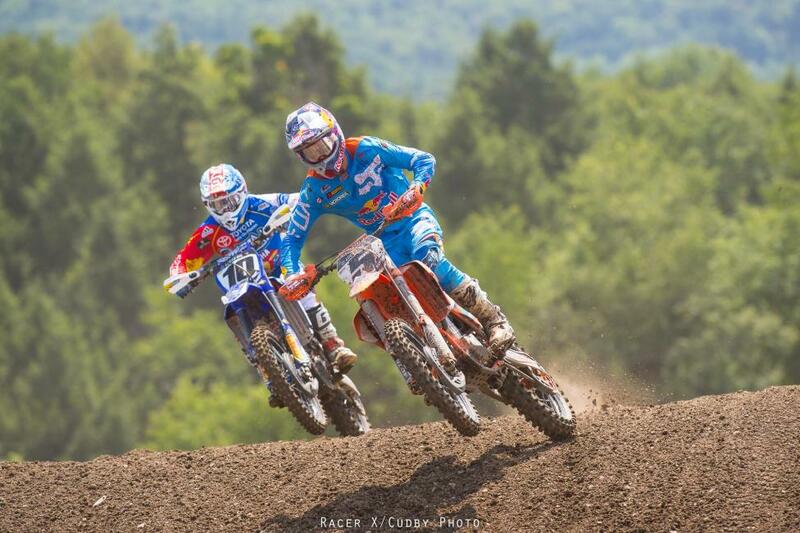 Roczen had another so-so day. He was fast early in moto one and stuck to Dungey’s rear fender most of the way, but in the latter stages Dungey got away. In moto two, he was in fourth, behind the leading Canard/Tomac/Dungey trio, and again lost ground late in the race. Clearly he is not quite the same guy that was winning races frequently in the first half of the year. Okay, back to Canard. He and his Honda Muscle Milk team made a huge change to his bike during the off week, trying out some KYB suspension instead of the normal Showa components. Not sure if that was the difference or not, but Trey was awesome all day, notching the fastest time in both practice sessions, and overcoming a bad start to rally back to fourth in moto one. Moto two was his virtuoso, though, as he passed Eli Tomac for the lead with a gutsy move at the bottom of Screw-U, and battled with Eli all the way for about a half a lap before securing the lead. Dungey got close at the end, but Canard’s moto win was solid and impressive. He was second overall with a 4-1. Unadilla has hosted a ton of international races, from Trans-AMAs, GPs and a Motocross des Nations, and the track’s international heritage still shows through. Just look at the French 1-2 in the first moto, with Christophe Pourcel and Marvin Musquin. Both have won overalls at the track before, and Pourcel, particularly, carves up ‘Dilla like a piece of art. He was fastest in practice (as per usual) collecting the Oakley Bomb Award, and led the first moto all the way, with Musquin closing up right behind him at the end. In the second moto, Pourcel holeshot again, but yielded to a game Jeremy Martin. Martin’s 3-1 was edged by Pourcel’s 1-2, giving Pourcel his first overall win this year. Pourcel says they’re still making changes to the bike and he’s getting more comfortable on his Yamaha every week. Martin said he wanted to win, but made too many mistakes in moto one. He bounced back strong in the second moto. Even though Pourcel didn’t have to beat him to win the overall, he said he wanted to go 1-1, but Martin was just a little too good. Musquin didn’t quite move forward in moto two like he did in moto one, and took 2-5 scores for third overall. Rookie Watch: Recent Loretta Lynn graduates Chris Alldredge (Monster Energy/Pro Circuit Kawasaki), RJ Hampshire (GEICO Honda), and Luke Renzland (CycleTrader.com/Rock River Yamaha) made their pro debuts on Saturday. Alldrege was the top finisher, placing eighth overall via 13-8 scores. After the race he said his expectations weren’t high entering the race and he was satisfied with his results. Hampshire was the best off the gate, starting inside the top five in the second moto. He would fall back to 16th in that moto after a crash. He finished the day thirteenth overall. "I went down a couple times and ended up 11th,” he said in a GEICO team statement. “Second moto was even better. I was up to fifth or sixth early, but I tucked the front end and dropped back to 15th. I raced back up to 11th or so and then had a pretty big crash and ended up back in 16th. It's good to get the jitters out.” Renzland finished seventeenth overall, but his day was impressive as he came from nearly dead last in the first moto to finish eighteenth. 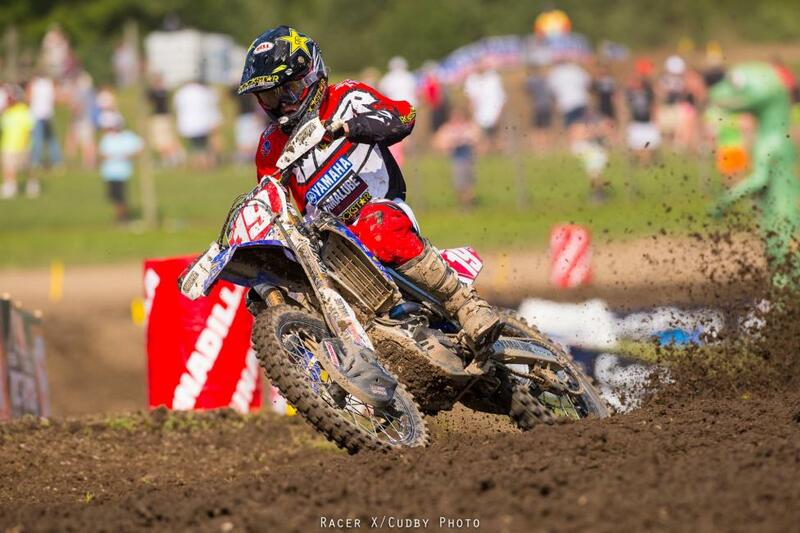 GEICO Honda’s Justin Bogle found the podium for the sixth time this season in the second moto. “It's late in the season but I still feel like I'm making progress every time out, so that's really good,” he said in a statement. “I'm so close to being on the podium every moto. There are just a few little things I need to improve and it will happen." GEICO Honda had Zach Osborne back for the first time since tearing ligaments in his thumb at Glen Helen. 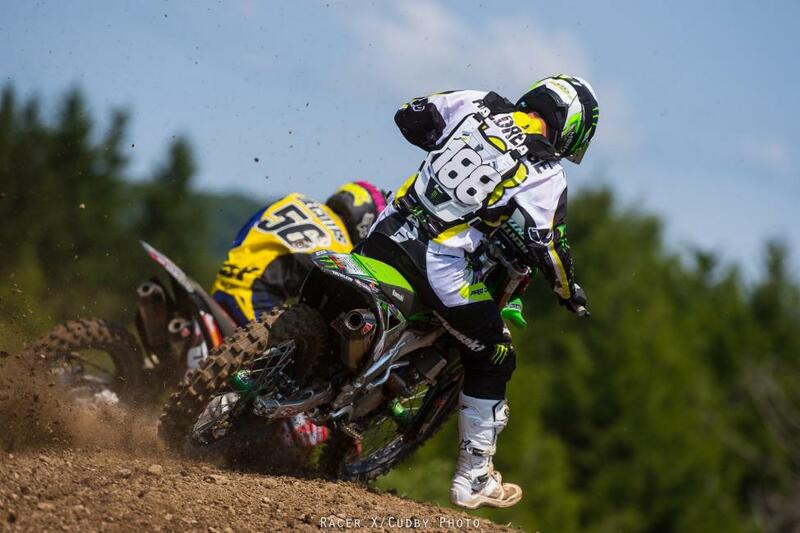 Osborne was fast in practice—finishing third overall—but had problems in his motos. “My confidence was high. Unfortunately, I got cross-rutted in the first lap of Moto 1, went down hard, and wadded up the bike pretty good,” he said in a statement. “I rode really strong the whole second race and got seventh. I pulled a pretty good start and then passed maybe seven or eight guys, so that was something to build on for sure. 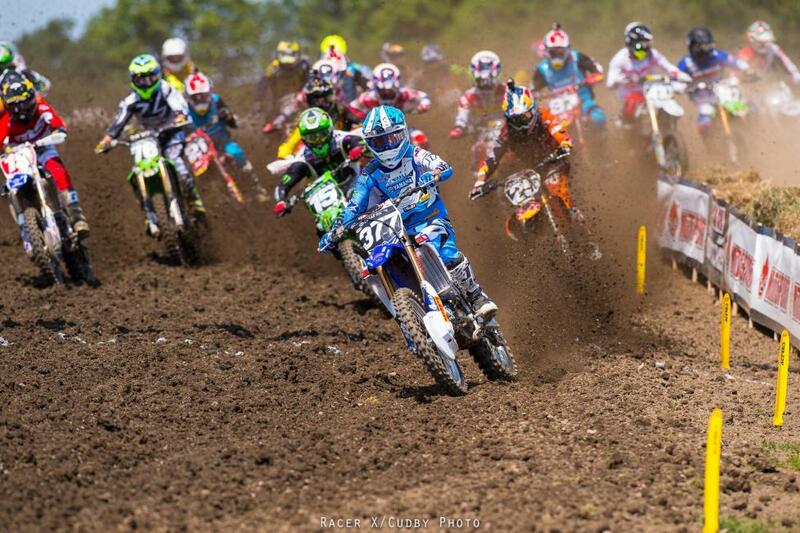 It's hard to come back mid-season when everyone else is in moto shape. You can train all you want but nothing prepares you for a national besides running the race." Matt Bisecglia went down hard early in the first moto and early reports are he suffered a broken hand. "In the first lap another rider hit me from behind in a corner and I high-sided over the bike," Bisceglia said in a statment. "Next thing I know I was eating dirt. I'm not exactly sure how my hand got hurt. I must have stuck it out when I went down. A lot happened in just a few seconds there. I'll get it looked at by my doctors at home and we'll decide what to do based on that diagnosis." Cooper Webb’s title chances may be all but over after a mechanical problem in the second moto resulted in a DNF. He would finish the moto 34th and fifteenth overall on the day. Starts were once again Blake Baggett’s demise, and this time he wasn’t able to muster a late moto charge. Baggett did climb to second in points thanks to Webb’s DNF, but sits 66 back of Jeremy Martin with just two races left.